Protein C is a vitamin K-dependent plasma glycoprotein that is a key component of the anticoagulant system. There are 461 amino acids. 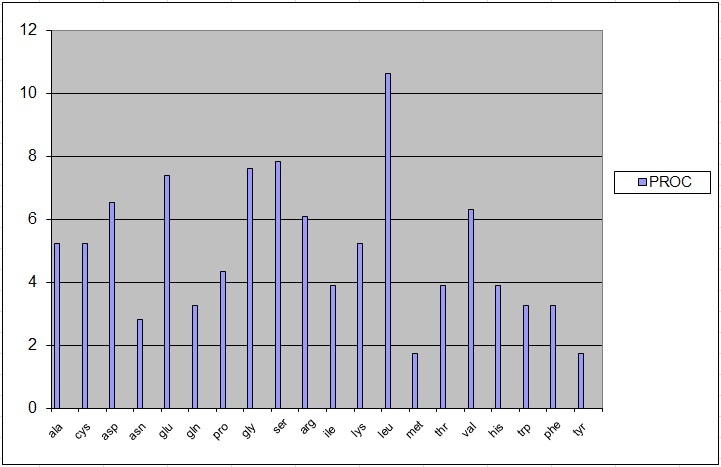 The PROC gene is located on the second chromosome (2q13-q14) and comprises nine exons. Protein C synthesis occurs in the liver and begins with a single-chain precursor molecule: a 32 amino acid N-terminus signal peptide preceding a propeptide. Protein C is formed when a dipeptide of Lys-198 and Arg-199 is removed; this causes the transformation into a heterodimer with N-linked carbohydrates on each chain. The protein has one light chain (21 kDa) and one heavy chain (41 kDa) connected by a disulfide bond between Cys-183 and Cys-319. The light chain contains the Gla- and EGF-like domains and the aromatic segment. The heavy chain contains the protease domain and the activation petide. It is in this form that 85–90% of protein C circulates in the plasma as a zymogen, waiting to be activated. The remaining protein C zymogen comprises slightly modified forms of the protein. Activation of the enzyme occurs when a thrombin molecule cleaves away the activation peptide from the N-terminus of the heavy chain. The active site contains a catalytic triad typical of serine proteases (His-253, Asp-299 and Ser-402). The vitamin K-dependent, enzymatic carboxylation of some Glu residues allows the modified protein to bind calcium. Partial (70%) N-glycosylation of Asn-371 with an atypical N-X-C site produces a higher molecular weight form referred to as alpha. The lower molecular weight form, not glycosylated at Asn-371, is beta. The iron and 2-oxoglutarate dependent 3-hydroxylation of aspartate and asparagine is stereospecific within EGF domains. The biological half-life of plasma protein C is approximately 6 to 10 hours. The protein C pathways are the specific chemical reactions that control the level of expression of APC and its activity in the body. Protein C is pleiotropic, with two main classes of functions: anticoagulation and cytoprotection (its direct effect on cells). Which function protein C performs depends on whether or not APC remains bound to EPCR after it is activated; the anticoagulative effects of APC occur when it does not. In this case, protein C functions as an anticoagulant by irreversibly proteolytically inactivating Factor Va and Factor VIIIa, turning them into Factor Vi and Factor VIIIi respectively. When still bound to EPCR, activated protein C performs its cytoprotective effects, acting on the effector substrate PAR-1, protease-activated receptor-1. To a degree, APC's anticoagulant properties are independent of its cytoprotective ones, in that expression of one pathway is not affected by the existence of the other. Protein C is a major component in anticoagulation in the human body. It acts as a serine protease zymogen: APC proteolyses peptide bonds in activated Factor V and Factor VIII (Factor Va and Factor VIIIa), and one of the amino acids in the bond is serine. These proteins that APC inactivates, Factor Va and Factor VIIIa, are highly procoagulant cofactors in the generation of thrombin, which is a crucial element in blood clotting; together they are part of the prothrombinase complex. Cofactors in the inactivation of Factor Va and Factor VIIIa include protein S, Factor V, high-density lipoprotein, anionic phospholipids and glycosphyngolipids. Factor Va binds to prothrombin and Factor Xa, increasing the rate at which thrombin is produced by four orders of magnitude. 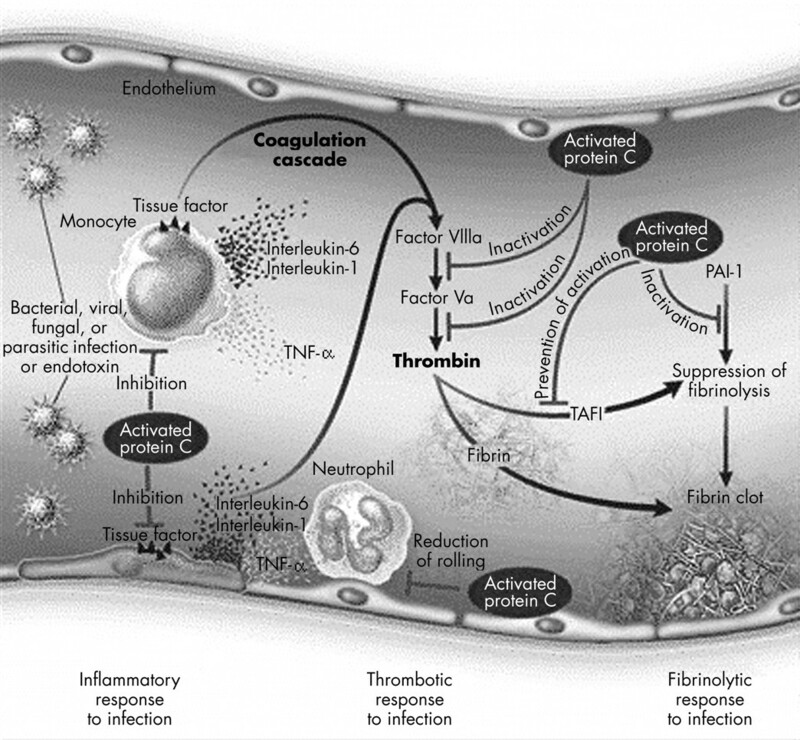 Inactivation of Factor Va thus practically halts the production of thrombin. Factor VIII, on the other hand, is a cofactor in production of activated Factor X, which in turn converts prothrombin into thrombin. Factor VIIIa augments Factor X activation by a factor of around 200,000. Because of its importance in clotting, Factor VIII is also known as anti-haemophilic factor, and deficiencies of Factor VIII cause haemophilia A.
APC inactivates Factor Va by making three cleavages (Arg306, Arg506, Arg679). The cleavages at both Arg306 and Arg506 diminish the molecule's attraction to Factor Xa, and though the first of these sites is slow to be cleaved, it is entirely necessary to the functioning of Factor V. Protein S aids this process by catalysing the proteolysis at Arg306, in which the A2 domain of Factor V is dissociated from the rest of the protein. Protein S also binds to Factor Xa, inhibiting the latter from diminishing APC's inactivation of Factor Va. The inactivation of Factor VIIIa is not as well understood. The half-life of Factor VIIIa is only around two minutes unless Factor IXa is present to stabilise it. Some have questioned the significance of APC's inactivation of Factor VIIIa, and it is unknown to what degree Factor V and protein S are cofactors in its proteolysis. It is known that APC works on Factor VIIIa by cleaving at two sites, Arg336 and Arg562, either of which is sufficient to disable Factor VIIIa and convert it to Factor VIIIi. When APC is bound to EPCR, it performs a number of important cytoprotective (i.e. cell-protecting) functions, most of which are known to require EPCR and PAR-1. These include regulating gene expression, anti-inflammatory effects, antiapoptotic effects and protecting endothelial barrier function. Treatment of cells with APC demonstrates that its gene expression modulation effectively controls major pathways for inflammatory and apoptotic behaviour. There are about 20 genes that are up-regulated by protein C, and 20 genes that are down-regulated: the former are generally anti-inflammatory and antiapoptotic pathways, while the latter tend to be proinflammatory and proapoptotic. APC's mechanisms for altering gene expression profiles are not well-understood, but it is believed that they at least partly involve an inhibitory effect on transcription factor activity. Important proteins that APC up-regulates include Bcl-2, eNOS and IAP. APC effects significant down-regulation of p53 and Bax. APC has anti-inflammatory effects on endothelial cells and leukocytes. APC affects endothelial cells by inhibiting inflammatory mediator release and down-regulating vascular adhesion molecules. This reduces leukocyte adhesion and infiltration into tissues, while also limiting damage to underlying tissue. APC supports endothelial barrier function and reduces chemotaxis. APC inhibits the release of inflammatory-response mediators in leukocytes as well as endothelial cells, by reducing cytokine response, and maybe diminishing systemic inflammatory response, such as is seen in sepsis. Studies on both rats and humans have demonstrated that APC reduces endotoxin-induced pulmonary injury and inflammation. Scientists recognise activated protein C's antiapoptotic effects, but are unclear as to the exact mechanisms by which apoptosis is inhibited. It is known that APC is neuroprotective. APC's antiapoptotic effects are part of the reason that APC is effective in treating sepsis, as reduced levels of apoptosis are correlated with higher survival rates in septic patients. Antiapoptosis is achieved with diminished activation of caspase 3 and caspase 8, improved Bax/Bcl-2 ratio and down-regulation of p53. Activated protein C also provides much protection of endothelial barrier function. Endothelial barrier breakdown, and the corresponding increase in endothelial permeability, are associated with swelling, hypotension and inflammation, all problems of sepsis. APC protects endothelial barrier function by inducing PAR-1 dependent sphingosine kinase-1 activation and up-regulating sphingosine-1-phosphate with sphingosine kinase. The activation of protein C is strongly promoted by thrombomodulin and endothelial protein C receptor (*EPCR*). The activity of protein C may be down-regulated by reducing the amount either of available thrombomodulin or of EPCR. This may be done by inflammatory cytokines, such as interleukin-1β (IL-1β) and tumor necrosis factor-α (TNF-α). Activated leukocytes release these inflammatory mediators during inflammation, inhibiting the creation of both thrombomodulin and EPCR, and inducing their shedding from the endothelial surface. Both of these actions down-regulate protein C activation. Thrombin itself may also have an effect on the levels of EPCR. In addition, proteins released from cells can impede protein C activation, for example eosinophil. Protein C may be up-regulated by platelet factor 4. This cytokine is conjectured to improve activation of protein C by forming an electrostatic bridge from protein C's Gla domain to the glycosaminoglycan (GAG) domain of thrombomodulin. In addition, Protein C is inhibited by protein C inhibitor. A genetic protein C deficiency, in its mild form associated with simple heterozygosity, causes a significantly increased risk of venous thrombosis in adults. If a fetus is homozygous or compound heterozygous for the deficiency, there may be a presentation of purpura fulminans, severe disseminated intravascular coagulation and simultaneous venous thromboembolism in the womb; this is very severe and usually fatal. Deletion of the protein C gene in mice causes fetal death around the time of birth. Fetal mice with no protein C develop normally at first, but experience severe bleeding, coagulopathy, deposition of fibrin and necrosis of the liver. The frequency of protein C deficiency among asymptomatic individuals is between 1 in 200 and 1 in 500. In contrast, significant symptoms of the deficiency are detectable in 1 in 20,000 individuals. No racial nor ethnic bases have been detected. Activated protein C resistance occurs when APC is unable to perform its functions. This disease has similar symptoms to protein C deficiency. The most common mutation leading to activated protein C resistance among whites is at the cleavage site in Factor V for APC. There, Arg506 is replaced with Gln, producing Factor V Leiden. This mutation is also called a R506Q. The mutation leading to the loss of this cleavage site actually stops APC from effectively inactivating both Factor Va and Factor VIIIa. Thus, the person's blood clots too readily, and he is perpetually at an increased risk for thrombosis. Individuals heterozygous for the Factor VLeiden mutation carry a risk of venous thrombosis 5–7 times higher than in the general population. Homozygous subjects have a risk 80 times higher. This mutation is also the most common hereditary risk for venous thrombosis among Caucasians. Protein C levels have long been noted to predict mortality in patients with sepsis. Because of this, and its pleiotropic anticoagulative and cytoprotective effects, protein C has long been suggested, along with many other drugs, for use in treating patients with severe sepsis. The Food and Drug Administration approved drotrecogin alfa-activated (DrotAA) in the clinical treatment of adults suffering from severe sepsis and with a high risk of death. Drotrecogin alfa-activated is a recombinant form of human activated protein C (rhAPC), i.e. it is a protein produced by recombinant DNA. It is marketed as Xigris by Eli Lilly and Company, but recently recalled and taken off the market. APC has been studied as way of treating lung injury, after studies showed that in patients with lung injury, reduced APC levels in specific parts of the lungs correlated with worse outcomes. APC also has been considered for use in improving patient outcome in cases of ischemic stroke, a medical emergency in which arterial blockage deprives a region of brain of oxygen, causing tissue death. Promising studies suggest that APC could be coupled with the only currently approved treatment, tissue plasminogen activator (tPA), to protect the brain from tPA's very harmful side effects, in addition to preventing cell death from lack of oxygen (hypoxia). Clinical use of APC has also been proposed for improving the outcome of pancreatic islet transplantation in treating type I diabetes.